Having finally discovered a dream of his own, Haru now finds his life undergoing a dramatic transformation, as he prepares to transition from high school to college in Tokyo. But Haru isn't the only one going through changes - Makoto, Rin, and Sosuke all have their own journeys to pursue, while those still in high school will have to reckon with both saying goodbye and taking over the clubs left behind. The transition out of high school can be a scary thing, but the boys of Free! are ready to take on the world, as they set off on new adventures while holding close to their treasured bonds. It's been interesting to watch the Free! franchise grow and transform, the show itself oddly echoing the journeys of its characters. The show's first season focused largely on slice of life and comedy, with its Rin-focused story offering a fairly shaky dramatic counterpoint. In Eternal Summer, the show seemed to revise some of its fundamental character assumptions, and focus more squarely on the anxiety of seeing high school ending, but not knowing where to go. After that season, series director Hiroko Utsumi moved on from Kyoto Animation , leaving the franchise split between Yasuhiro Takemoto (a KyoAni legend, who'd direct the Starting Days prequel film) and Eisaku Kawanami (a relative up-and-comer, who'd handle the anthology films and ongoing sequels). After directing two films that were more or less summaries of the first seasons, Take Your Marks is essentially Kawanami's formal debut as series lead, giving this “film” a significance beyond its immediate place in the franchise . I put film in quotation marks there because in truth, Take Your Marks doesn't really feel like a film. Though it did enjoy a theatrical release, it's essentially a series of four OVA episodes bridging the gap between seasons two and three, with each of these episodes featuring largely self-contained adventures. Additionally, it feels like this film was intentionally designed to be inessential viewing; nothing you need to know about for season three takes place in these episodes, and they largely stick to familiar slice of life templates. 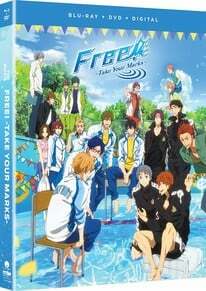 So given all that, is Take Your Marks actually worth a watch? In my opinion, absolutely. I was initially disappointed to see this wasn't going to be a cohesive and dramatically consequential film, and further disappointed to see Free! returning to the goofy, irreverent tone of its first season, but Take Your Marks ultimately won me over purely based on how dang charming and good-hearted it was. Between its first and second seasons, the Free! franchise seems to have developed the unique ability to dance between the drama and coffee shop versions of itself, with heavy concerns like Haru's struggle with identity segueing into dorky adventures about trying to enlist new club members. And if you have any fondness for Free! at its fluffiest, you're certain to enjoy this stretch of episodes. Take Your Marks seems to blend season one's joke-heavy slice of life tone with season two's grounded, end-of-adolescence focus, resulting in stories that temper their gaiety with the mundane, universal realities of entering college. The first segment is a perfect example, as it spends its twenty minutes almost entirely focusing on Haru and Makoto's search for a Tokyo apartment. There's little payoff in terms of overt drama here; it's just watching two friends we've come to know well grappling with a major shift in their life, with the episode's unvarnished honesty and reflections of mutual trust offering their own reward. The film's other segments are a bit sillier than that, though they all offer their own character beat rewards. In the second, Rin and Sosuke's underclassmen end up traveling with them to a hot springs, resulting in a mix of “Rin and Sosuke take their kids on a vacation” fanservice and some very welcome filling out of Sosuke's character. In the third, Rei's determination to make sure the club gets new members results in them making a student film advertisement, with a premise and costumes suspiciously similar to season one's ending. And in the fourth, an absurd game of telephone ends in Haru making a dramatic speech to Rin that I could have sworn was intentionally parodying Eternal Summer's melodrama. In short, Take Your Marks is Free! having a whole lot of fun, reveling in its broad cast and rewarding your investment in this overall franchise . It's messy in a lot of ways - there's no real focus, and the film seems far too intent on including every cast member (the Starting Days crew get about twelve seconds apiece). There's nothing like the pointed character drama that made Eternal Summer so gripping, and no attempt at the staggering visual setpieces that elevate the series proper. And yet, for all those reasonable complaints, these goofy, self-aware adventures are still creative and well-executed enough to be their own reward. As far as the production goes, Take Your Marks feels like a slight step over TV production quality as a whole, but not a particularly meaningful one, and certainly not comparable to KyoAni's prestige titles like A Silent Voice . The series seems to have moved away from Utsumi's heavy focus on both visual symmetry and narrow, shot-specific color palettes, leaning more towards a thoughtfully shot but ultimately familiar sitcom style. This style actually works well with this film's generous character acting, but I felt these episodes on the whole felt far less beautiful than Eternal Summer's standard, and often more functional than genuinely inspired. Free! is still a very accomplished production by your usual anime standards, but compared to the recent Kyoto Animation canon, it feels both less beautiful and less cohesive in its visual identity. This film's packaging is likewise pretty minimal; just the bluray and DVD in a standard case, with no included features beyond a few postcards featuring the main cast in costume. Still, if you're here for the cast and their continued adventures, you'll almost certainly have a good time. Take Your Marks lives up to its name; it is mostly a throat-clearing exercise, but it turns out that simply hanging out with the cast of Free! is pretty fun all by itself. Though I hope Kawanami will find a stronger visual identity for this franchise going forward, I'm still on board to spend more time with these swimming boys.